The leggie picked up a hat-trick, four wickets in the first over and the league’s maiden fifer. 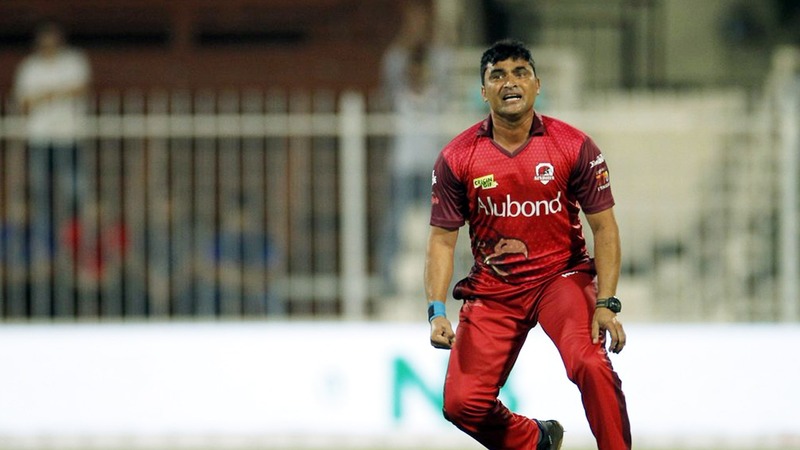 Leg spinner Pravin Tambe became the first bowler to bag a five-wicket haul in the T10 format when his hat-trick in the opening over helped his team Sindhis beat defending champions Kerala Knights in the T10 League at Sharjah on Thursday. Electing to bowl first, the 47-year-old opened the bowling for his side but made a poor start as his first two balls were wides that conceded six runs. But with his second delivery he got rid of the dangerous Chris Gayle and after a dot ball claimed a hat trick that accounted for Eoin Morgan, Kieron Pollard and Fabian Allen. Kerala were reeling at 6/4 after the opening over. Tambe finished his quota when he came on to bowl the third over, where he struck in the second ball by sending back wicketkeeper Upul Tharanga and claiming half the side single-handedly. Tambe, who played in T20 Mumbai for NaMo Bandra Blasters, ended up with figures of 5/15 in his two overs with four of his victims sent back on ducks. Pravin Tambe becomes the first player to take a 5-wicket haul in the T10 league history. "As a bowler, you have to think that you can't give any sixes or fours," Tambe said. "With that in mind, you will get wickets, and that's what I got today. "In this format, you don't get a chance to set a batsman up," he added. "Every ball is going to go for a six. That's what you have to think as a bowler in this format, so you try to bowl in the channels, and if you succeed in that, then you can survive in this format." Kerala eventually scored 103/7 which the Sindhis chased down with 14 balls and nine wickets to spare with Tambe named the Man of the Match. © Copyright 2019 T20 Mumbai - All Rights Reserved.